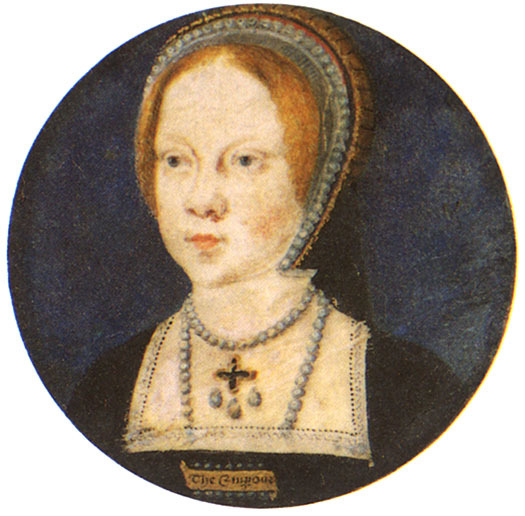 Was there ever a portrait done of Mary Tudor, henry's daughter, as a child? She was his sole legitimate heir for many years, and it seems strange there is no record of a portrait being done of her as a child? It shows a rather serious looking girl in a red dress. She has wide-eyes, a rather small mouth,and her hands are demurely folded on her lap. If it is Mary, she's certaintly was a cutie! I have a piggy-back question for this... Is it a myth that Anne Boleyn made famous the French-style hood? In the portrait of the young Katherine of Aragon, and indeed in the two pictures of Mary here, the sitter seems to be wearing a French hood. Is this not specifically French, but more of a basic head-covering / headdress? It is not a myth, no. Mary Tudor, duchess of Suffolk, had been queen-consort of France, hence wearing it in her marriage portrait. But she was seldom at Court in the years immediately following her return (1515.) They gained in popularity after 1522, when Anne Boleyn returned as a debutante. By the time she became the King's fiance, in 1527, the fashion had already spread even to those who would politically come to hate her. The portrait/miniature where Katherine of Aragon appears to be wearing a French hood is actually a Juliet cap, something quite different.